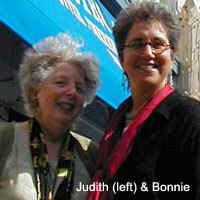 Judith Montell began her career producing and directing professional summer theater companies in Buffalo, New York, and Bismarck, North Dakota. She has worked as a production assistant for Broadway shows and as a stage manager and general manager for off-Broadway productions. From theater she moved into the world of film as a production manager for New York-based Amram Nowak Associates, which produces documentary and educational films. After taking a 15-year break to raise two daughters, Montell began producing her own documentaries. Forever Activists: Stories From the Veterans of the Abraham Lincoln Brigade, her first feature-length film, received an Academy Award nomination for Best Achievement in Documentary Feature. It also received Special Jury awards at the San Francisco International Film Festival and the National Educational Film and Video Festival. You Are History, You Are Legend, a 25-minute sequel to Forever Activists, commemorates the Spanish Civil War's 60th anniversary, when the surviving veterans were invited back to Spain to receive honorary Spanish citizenship as a thank-you from the Spanish people. In addition, Montell recently completed Pasporto al la Tuta Mondo, a series of 16 half-hour tapes teaching the universal second language of Esperanto. Timbrels and Torahs: Celebrating Women's Wisdom, a film showing how older Jewish women can claim a position as wise elders in their communities with the creation of a new ritual, premiered at the San Francisco Jewish Film Festival in 2000 and has been shown around the United States and at festivals in Germany and Italy. Her latest film, Professional Revolutionary: The Life of Saul Wellman, is currently screening at the 2005 San Francisco Jewish Film Festival.